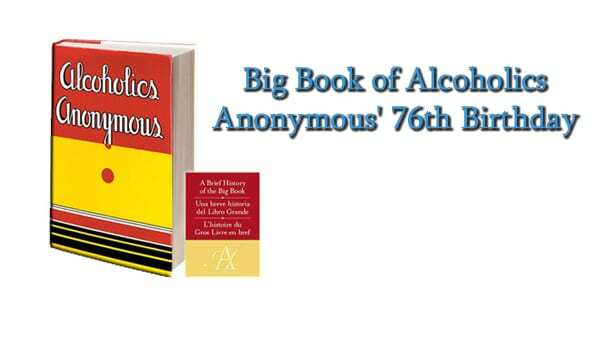 April 10, 1939 marks the publication date of “Alcoholics Anonymous: The Story of How Many Thousands of Men and Women Have Recovered from Alcoholism.” One of the best-selling books of all time (it has sold more than 30 million copies), the volume is better known to millions of recovering alcoholics and addicts as “the Big Book.” Its influence on the world’s health and the treatment of alcoholism and other addictions is immeasurable. In 2011, Time Magazine placed the Big Book on its 100 most influential books written in English since 1923 (not coincidentally the year the magazine was founded). In 2012, the Library of Congress designated it as one of the 88 books that shaped America. Regardless of one’s personal thoughts or beliefs towards AA, the Big Book, the 12 Steps or any of the 12 Step Fellowships, it cannot be argued the impact that the Big Book has had on the treatment and recovery of alcoholism and addiction, on the families of addicts and alcoholics and the society at large. Prior to AA and the Big Book, there was one movement that seemingly has success in getting alcoholics sober: The Washingtonian movement, a 19th century temperance society founded on April 2, 1840 at Chase’s Tavern on Liberty Street in Baltimore, MD. Before that time (and also after the group seemingly died or disbanded decades later), people suffering from substance use disorders such as alcoholism or addiction were considered morally corrupt or mentally insane and taken away to asylums and sanitariums. It was through a series of events that eventually led to the meeting of Alcoholics Anonymous co-founders Bill Wilson and Dr. Bob Smith to meet in 1935 and then, with the input of other new members of AA four years later, place their combined experiences into a text that would eventually be titled “Alcoholics Anonymous”. The purpose of the book was to act as a text book, to be sent around the country to alcoholics in need who could read the experiences and follow the directions of men and women who had gotten in sober, in the hope that they would then get sober and go out and find out suffering alcoholics to work with and share experiences. The worldwide phenomenon has grown to worldwide meetings, millions of sober alcoholics and the publishing of the Big Book in over 150 countries and over seventy languages. While the addiction treatment and recovery industry is often fragmented into treatment approaches, modalities and theories of what works best to treat addiction and alcoholism, there is little doubt that the 12 Step model has been the most implemented approach and therefore the most influential form of addiction treatment. The Big Book, the text book outlining the 12 Steps and the directions how to take them, was the catalyst for this treatment. Therefore, as we celebrate sobriety and recovery and celebrate living in a society that allows access to treatment for everyone who needs it while looking upon addiction and alcoholism as an illness and disease rather than a moral failing, let us also celebrate the 76th birthday of the Big Book of Alcoholics Anonymous and the tremendous positive impact it has had for millions of people worldwide.